For more than 50 years, Federally Qualified Health Centers (FQHCs) have delivered comprehensive, high-quality preventive and primary health care services to patients regardless of their ability to pay. With revenues exceeding $21 billion in 2015, FQHCs constitute the largest network of primary care providers in the US and the second largest nonprofit health system, behind only Kaiser Foundation Hospitals. If FQHCs were listed on the Fortune 500, they collectively would rank #133, on a par with Staples and ahead of Whirlpool, Starbucks, Kraft Heinz and Facebook. However, as independently operated, locally-controlled nonprofit organizations, FQHCs focus on providing excellent care at the local level to their 24 million patients in the 9,800 urban and rural communities they serve. Health centers are facing the prospect of a changing financial landscape. Now more than ever, there is a need to demonstrate the value health centers have on the communities they serve and communicate this impact. 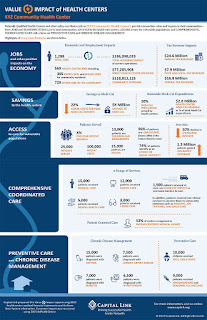 To illustrate the value and impact of health centers nationally, Capital Link has created the Value + Impact of Health Centers, an updated version of our Economic Impact Analysis. Click on the image below to view a sample of the infographic and supporting data report. Capital Link’s customized Value + Impact of Health Centers is available for $2,000, discounted from $2,500. Order by March 17th for use at the NACHC Policy & Issues Forum. To assist PCAs in advocacy efforts, we are also offering customized statewide and congressional district Value + Impact of Health Centers infographics and supporting data reports. Click here to view a sample of a statewide report. Interested PCAs should contact Steve Rubman, Director of Data & Information Systems, at srubman@caplink.org or 617-422-0350 for more information.